No matter your particular model in the multisite church spectrum, from on-site venue to over-time mission, a unique, intentional and shared church DNA is core to campus alignment and critical in the economy of shared resources. The most useful tool in your hands to develop and define church DNA, is the Vision Frame. What are we doing? Our missional Mandate. Why are we doing it? Our missional Motives. How are we doing it? Our missional Map. When are we successful? Our missional Marks. Where is God taking us? Our missional Mountaintop + Milestones. …becomes a foundation for the Campus Pastor drawing up the launch blueprint. …drives alignment to the Campus Pastor leading on the ground every Sunday. …gives direction to the Campus Pastor asking “What’s Next” in reaching the community to which they are called. However, many Campus Pastors are, at this very moment, either feeling the need to be doing the “same thing” across campuses or feeling the pain from doing their “own thing” at one campus. This is because a daily tension exists between leading from the DNA of the church and developing the contextual personality of the campus. In this missional tug of war, every passionate leader will let the implementation of seemingly immediate requirements of outreach and transformation win-out over the protection of seemingly irrelevant methods or organizational programs. Clarity isn’t everything, but it changes everything, and the time spent developing and communicating your Vision Frame as a tool for vision-centric growth is the best investment that you can make toward launching or aligning your multisite church. Read Up. Download the Church Unique Visual Summary from Auxano. Learn More. 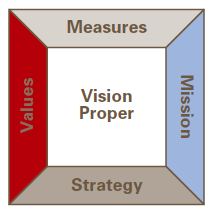 Explore a comprehensive overview of the Vision Frame on Will Mancini’s blog. Get Started. Begin the conversation about strengthening or developing your church’s Vision Frame. Pingback: What Is Your Multisite Church Model?